We are in the midst of a beautiful summer and I would like to express my admiration this evening to those who stay for a long time on the hill, the volunteers who are here for a year and those who help out for a few weeks. Through their commitment they support the meetings so much. Among them are some 120 young people from Asia, Africa, Latin America and the Middle East. For most of them this is the first time they are in Europe. Everything is different: the food, the climate, the way human relationships are lived. We thank them a lot for daring to come all the way here. We would like to listen to them in order better to understand their countries and how they live there as Christians. This summer the presence of Arab Christians is striking, from Egypt, Palestine, Jordan, and Lebanon. They often experience tensions in their countries. To welcome them we have been singing in Arabic "Ubi caritas Deus ibi est". What a surprise for many to discover that in Arabic God is called "Allah", and that Christians and Muslims have always used the same word. We would like to be close to these young Arab Christians. At the end of September some brothers and a hundred young Europeans and Middle-Eastern will go with me to Egypt, to spend a few days sharing and praying with one hundred young Egyptians. Brothers also make visits in Lebanon. They are discovering many initiatives there that allow dialogue between Christians and Muslims. We are happy to welcome two young Muslims from Lebanon, Mohamad and Ali. I thank them for having the courage to come and live in a Christian place. All together we can create a life of sharing on the hill. The simplicity that you accept helps enormously: the long queues for meals, kneeling or sitting on the floor in the church, the lack of wifi.... In short, sharing the same simple conditions is conducive to creating friendship. You received the proposals for 2017 at the beginning of the week. The second one invites us to "simplify our lives in order to share". For us brothers, a continual simplification and a spirit of sharing are fundamental. This leads us to become a microcosm of a universal brotherhood. For the early Christian communities, material sharing was an integral part of their faith in Christ. If our communities, our parishes, our movements could give more attention and energies to such a sharing, we would be a clearer sign of the Gospel! In Christ Jesus, God came to share our human condition until death, even a violent death on the cross. And Jesus is risen. When we put our trust in him, he makes us witnesses to his love. He inspires us to accomplish acts of sharing in the face of human suffering, the humiliation of poverty, the trials of the homeless and migrants. Let us have the courage to go towards others, even with very limited means, with almost nothing. Sharing our time is already important in a world that drives us to be efficient and not waste time. We should try to have a simple lifestyle. This helps us better to appreciate the gift and beauty of creation. It is true that we may be afraid to share what we have. But when we overcome our resistances we discover joy. We see this every year during the European meeting that we organize after Christmas in a large city on the continent. The hospitality offered to thousands of young people gives great joy to those who are welcomed, as well as to those who offer hospitality to them. So it looks as if the welcome in Basel for the next European meeting will be very warm. Insofar as we seek to be close to Christ, we become free for a life of sharing. But it is essential to root our commitment in God’s love for us. For this we meet here three times a day in the church. It is a way of drawing from the wellsprings of love: turning to Christ who opened this wellspring on the cross, welcoming the Holy Spirit who makes this spring flow in us day and night. In Taizé we are very grateful for the encouragement that Pope Francis gives us for a life of joy, simplicity and sharing with the poorest. He has already welcomed me three times for a personal conversation. This week I wrote to him to tell him what is happening here this summer. I would like to ask you to pray for him every day. Even a sigh in a fraction of a second is enough. Beyond Catholic believers and even beyond Christians, he lifts up a hope of peace in humanity. Razan : Hello, my name is Razan. I am 22 years old, I am from Bethlehem, Palestine. I am a student in Occupational Therapy in the Bethlehem University. I come from the Don Bosco church. Don Bosco is not just a church, it is also a school and a community which unites Muslims and Christians together in different activities. 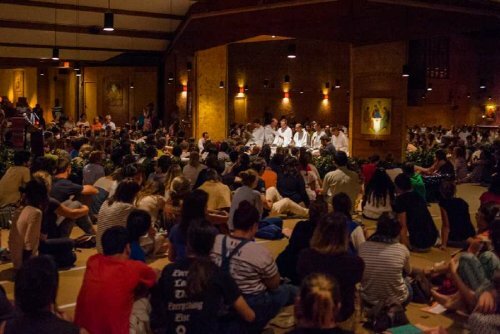 Here in Taizé, although we are from different countries, backgrounds and religious beliefs, we live in peace and are able to share our lives together. This is because we left everything behind, especially the noisy world outside in order to be with one another. Jesus said: Go, sell your possessions, come and follow me. He said this, because richness and peace are inside our hearts. Life has no meaning if not shared. Every act fades away, if it is not made in the service of others. When we all go back home, let us remember to live in simplicity. Let us pray for one another, for the people we met here, so that every one of us might become in one’s society bearer of peace and simplicity in heart.